I can count the number of times we have been camping (glamping) as a family on one hand (well one finger actually). We keep talking about doing it and either buying a tent or hiring a RV or staying at an on-site camping ground in a caravan or lodge. I have fond memories of doing this as a kid and my husband used to do it every weekend when he lived in Australia. Now our eldest keeps begging us. 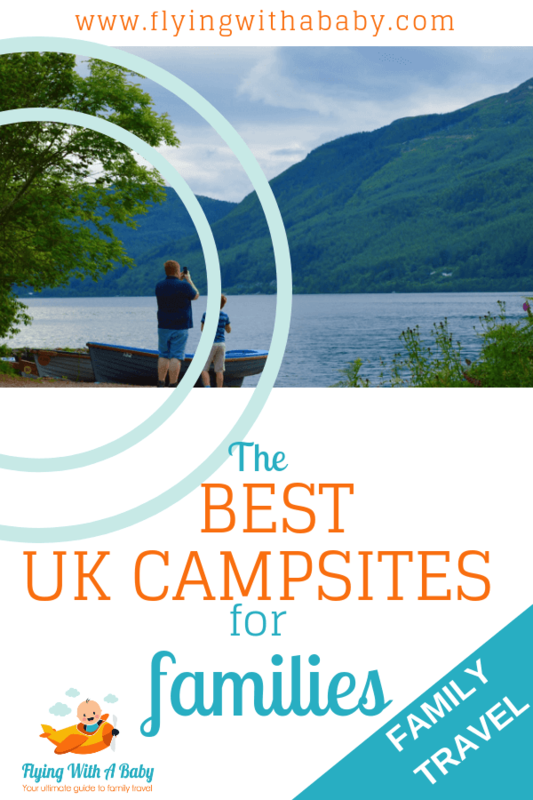 As I know pretty much zero about camping in the UK as a family, I’ve been asking those who do it on a regular basis to help us plan where to go and which are the UK’s best campsites for kids and which campsites are the most family friendly. From back to basics traditional camping to holiday parks with lots of facilities, or if you prefer to go glamping, this guide covers recommendations from people who have visited and loved their stay. Do you absolutely need wifi? Is there a place to charge your phone if needed? Henlow Bridge Lakes has lots of playgrounds, bunny rabbits and guinea pigs to hold, goats to walk, chickens to see. Free tractor trailer rides and entertainment during holidays and a fun tent and bouncy castle. Enjoy walks around the fishing lakes – there is even a kids fishing lake. Caravans and RV’s 55 hardstanding- 10 amp electric and water close by. 125 grass -10 amps electric and water points, perfect for tents, caravans and RVs up to 11 metres. Hayward’s Amenity Block which has underfloor heating, baby changing facilities, a disabled wet room, showers, toilets and a laundry room. Free activities during the summer holidays; e.g goat walking, soft play, arts & crafts. Tents (no electric hook-ups available for tents however there are power-points located in the facilities blocks. Caravans and motorhomes: 8 Grass Hook-Ups, 7 Hard-Standing Hook-Ups – include a concrete pad for level parking, an adjacent patch of grass suitable for awnings, drinking water tap and grey water drain. Electricity is included in the nightly rate. Campervans and Trailer tents have perhaps the most pitching flexibility as they can choose to pitch alongside the tents, or if they prefer, on the electrical hook-ups. 3 minutes walk from the beach! Four modern amenity blocks with unlimited hot water, bathroom, disabled facilities, baby changing facilities and laundrette. Two indoor swimming pools: a lap pool and a play pool with water flume for the kids. There’s also a whirlpool bath to relax in, an amusement arcade and indoor soft-play zone. 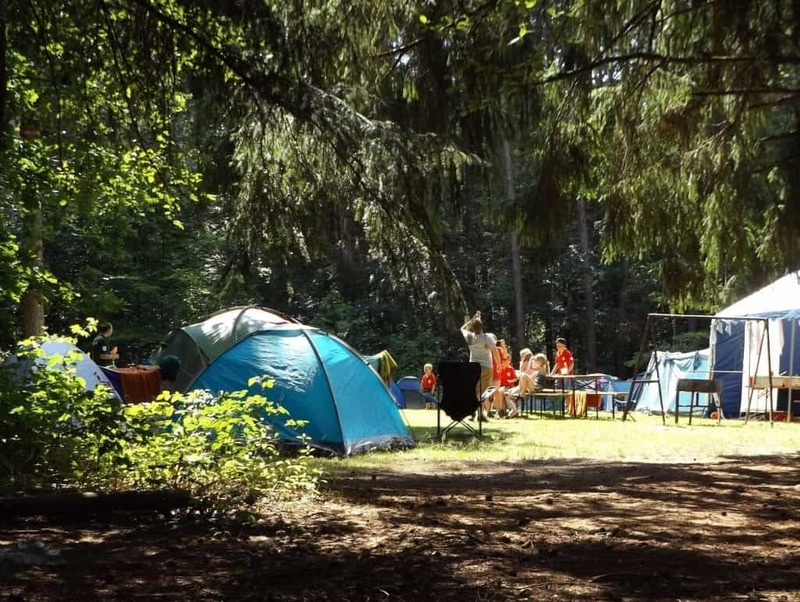 All pitches are divided by hedging or shrubs to offer you an individual, secluded camping experience. Every pitch has a 10amp electricity supply. As well as grass pitches they offer awning friendly gravel hardstanding and tarmac with artificial grass pitches. Laundry room with coin operated commercial washing machines and dryer. Standard Pitches -A well kept grass pitch, with 10amp 240V electric terminals. 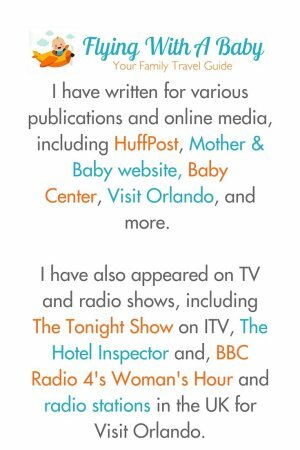 You can bring your own leads or hire. Premium Pitches -Situated in a prime camping location these pitches have water, electric, TV connection and access to the on-site movie channel. Premium Plus Pitches – These campsite pitches offer the same camping facilities as the premium pitches but have the added extra of an all weather semi hard standing base. Super Pitches – A well-kept grass pitch, with water, electric hook-up, grey waste drainage, TV connection and access to the on-site movie channel. These pitches are situated in a variety of areas onsite giving you plenty of choice. Super Plus Pitches – These campsite pitches offer the same facilities as our super pitches but have the added extra of an all weather semi hard standing base. Wild Tribe, an outdoor skills adventure club. Onsite arcade filled with amusement games suitable for all ages. Table tennis, a pool table and darts board across in the conservatory. Free heated showers, family bathrooms suites with baby changing units, disabled facilities and modern toilet blocks are located throughout the park. Safari Tents – sleeps six plus a cot, are large and well equipped with king size bed, 2 single beds and double den bed. Bathroom and kitchen inside the tent, with wood burning range cooker for cooking on and baking in, dining area and lounge, out to covered veranda, with stair gate for safety, all built on a sturdy insulated wooden base set in stunning countryside in Cornwall. All bedding, sheets duvets and covers, pillows and covers are provided (all beds and pillows have protectors fitted), except for a cot, please bring your own. bath towels and hand towels are provided. Plus tea towels. Hot water is provided by an instant gas water heater situated outside the tent. Hot and cold water are mains water fed. There is a double shower and a washbasin inside the tent. Electricity is provided inside the tent. There isa toaster, kettle, fridge freezer and lights in the kitchen, bathroom and lounge area powered from two double sockets situated in the kitchen. 230 Volt 50 Hz supply with ELCB breaker limited to 1Kw. Large trampoline (with safety netting) and a climbing frame with swings. Premier all weather pitches- 2m x 12m pitches with gravelled hard standing that are ideal for touring and motor home breaks whatever the weather. Standard touring Pitches – 10m x 10m grass pitches to suit any tent or caravan accommodationSuper Pitches – 12m x 12m pitches with hard standing that are ideal for touring caravans, and motorhomes. The yurt will sleep 4 to 6 people, ideal for a family or a real treat for a couple. Each yurt is positioned in its own secluded spot with plenty of space and privacy and has its own outdoor seating area with barbeque facilities. Close by to the yurts we have the barn which is equipped with toilets and a shower. A fully equipped kitchen with indoor dining area and each yurt is allocated its own fridge and food storage box.Adjacent to the kitchen is a snug room with sofas and chairs where you can relax and unwind. The snug has a selection of games for all ages including pool, darts and table football, as well as art stuff for kids. Standard – A grassy space for tents or small camper vans. Average size 10 metres by 8 metres. Will take a tent 6 x 5 metres (excluding guy rope). Standard XL – A grassy space for larger tents. Average size 12 metres x 9 metres. Will take large family tent. Serviced – A grassy or full hard standing pitch which has an electric hook up point (16 amp supply). Average size 10 metres x 8metres. Will take a tent 6 x 5 metres, motor-home or caravan plus awning. Serviced XL – Grass pitch with electric hook up point. Will take a large family tent, max 7 metres, caravans or motorhomes. Pitch Plus – Grass pitch with electric hook up, water point and grey water drain. Suitable for tents, caravans or motorhomes. Super Pitch – Extra large pitch approximately 14 metres by 10 metres. Gravel car parking space. Will take tents up to a max size of 7 metres, or caravan plus awning. Electric hook up point, Water point and grey water drain. Premier Pitch – Extra large pitch approximately 14 metres x 10 metres. Gravel car parking space. All have a brick stand for your own BBQ and large wooden picnic bench. Some have cycle racks and great views, some are marvelously secluded. Sea View Pitch – Serviced pitches found at the bottom of our site, overlooking the gorgeous North Devon coastline and the Bristol Channel. 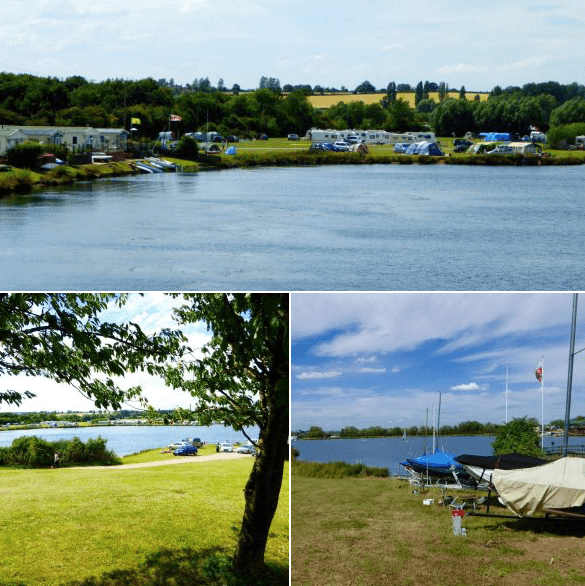 Lakeside Gravel Pitch – The Lakeside gravel pitch has all the facilities of a premier pitch but has direct access to the water via a gate at the back of the pitch as well as the benefit of being so close to the beautiful lake. Luxurious shower and toilet blocks including; Under floor heating, Luxury showers and washrooms, Toilets and hand basins, Family shower room, Disabled shower & toilet. Washing up & vegetable preparation area. Private Fishing Lake (coarse fishing) and fishing tackle hire: Learn More. 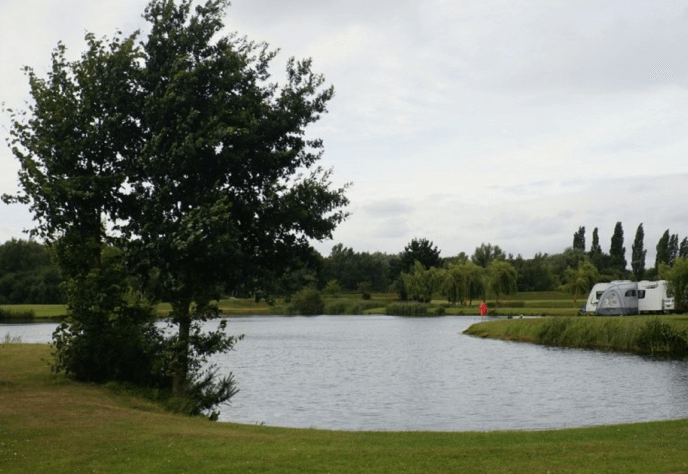 Fisherman’s Pitches – direct access to the fishing lake (via pitch gate). Pitch Plus pitches – containing own water supply & waste water drainage. The farm is a fully working farm with chickens (free range) ducks, pigs & cows. There is a farm shop on site. Self catering log cabins – Each log cabin has an impressive double bedroom with en-suite facilities and two twin rooms with an additional family bathroom. Grass – free camp, you choose where you’d like to go. Mains connected toilets, free hot showers (with no charge for use and plugs for ladies hairdryers etc.) and hot water washing up facilities – You can blow up your air matresses and freeze your ice packs for free! Recharge your mobiles in the reception (at your risk) for only £1 a go. East Fleet Farm – Dorset. Bathrooms with shower, toilet and hand basin, playground, indoor play barn, ice cream, waffles and pizza vans, made life a breeze for all the family. Our generously spaced pitches are all well marked and allocated to allow units up to 6m wide and 8m deep. There are also some larger and smaller pitches available. There are electric hook-ups and basic camping pitches available on all areas of the campsite. Gravel hardstandings are an option at no additional charge. Three amenity blocks at East Fleet Farm. In the top field a newly built facility has 16 luxury (8 ladies and 8 gents) shower suites in a cedar clad, heated building. There is also a new disabled shower room (with Radar key access) and indoor dishwashing room. Also in the top field, our modern toilet and shower block accommodates high quality ladies and gents facilities. There are also 4 large family shower rooms, each containing shower, sink and WC in this building. Just outside are the continental style covered dishwashing areas and separate chemical toilet disposal facilities. In Stable Field there is a log cabin amenity block. This facility offers unisex shower suites, ladies and gents wc’s, full disabled shower/wc room, and indoor dishwashing room. It also features underfloor heating to keep your toes warm on those chilly mornings. 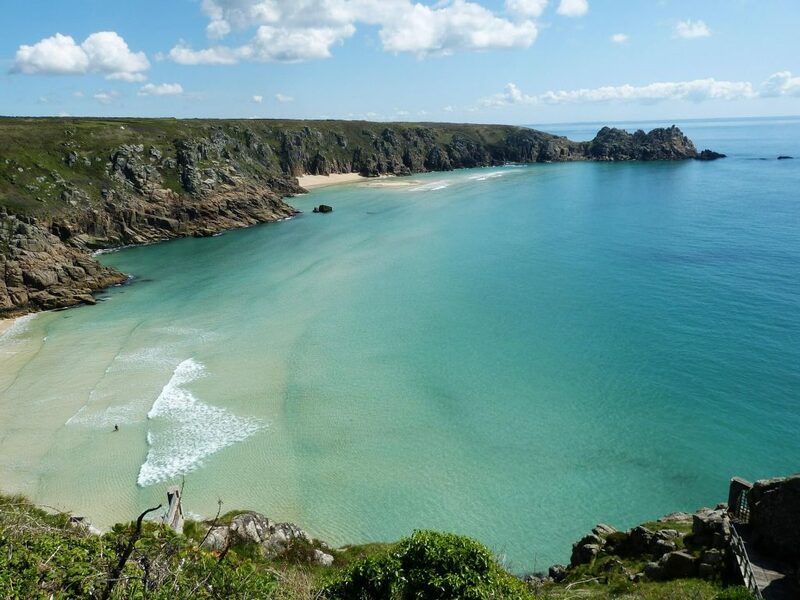 The site has 55 pitches and this includes 5 for caravans or motorhomes and 7 with pre-erected Soul pads / Bell tents which are available for hire. Bell tents – Bell Tents where you will find comfortable mattresses, cushions, a small table with tea lights and a jug and glasses. The four and six man tents have cosy little woodburning stoves inside to keep the chill off at night. A shower and toilet block, washing up sinks, fresh drinking water and a chemical toilet disposal point. You are welcome to bring your dogs provided they are well behaved, kept on a lead at all times and you are prepared to clean up after them. Dogs, cats, Kune Kune pigs, chickens, ducks, geese, rabbits. 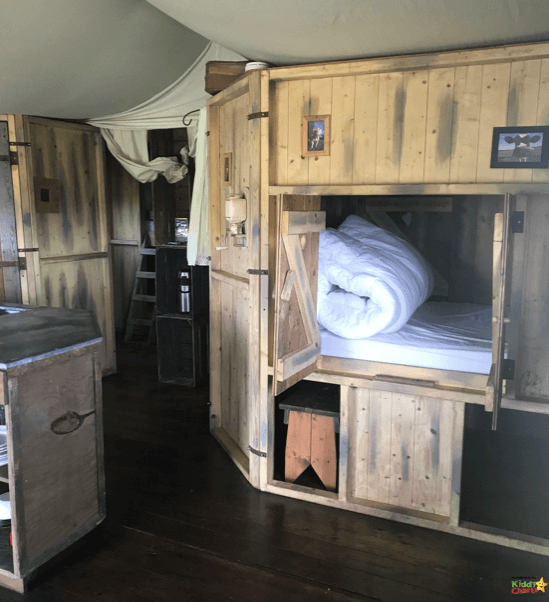 Tipi – oak Flintstone style king size bed and 2 day beds with a country rustic interior, solar lights and an fully equipped kitchen unit and storage inside. Shepherds huts – cosy double bed, eiderdown cover, scatter cushions. A wood burner, a kitchenette, quaint curtains, rugs, all the things needed to make this your own special world once inside. Eco-Pods – Budget Glamping, the pods offer an alternative to pitching your tent. Bring all your camping equipment, just no beds and no tent to pitch. Table for 2 outside, solar lighting, you can hire a fire-pit to complete your stay. “We absolutely love Croft Farm Water Park in Tewkesbury and have been for the last few years, with another trip booked for this summer too. The camp site is set around an old quarry which has been filled with water to create a water sports lake. They have sailing, paddle boats, windsurfing etc plus a club house, bar, coffee shop and gym (not that I’ve ever used it!) The thing we love about the site the most is that they allow groups, many around Gloucestershire don’t. Our next trip is with a big group of school mums, dads and kids. I just know all the kids are going to have a blast.” To read more of Lisa from Travel Loving Family’s review and experience of family camping, see here. Glamping Pods– Each pod has its own heating and can sleep up to four adults. There is a toilet & shower block facility located nearby and all the pods are lockable. All you need to bring is a sleeping bag and pillow. Holiday Log cabins -purpose-built Scandinavian-style heated log cabins, which can sleep up to eight in each. These cabins contain a living room with sofa bed, en-suite facilities, and also benefit from a large veranda ideal for storing wet items and muddy footwear. Holiday Lodge 31- The lodge can accommodate up to four people with a double sofa bed in the lounge. Enjoy watching the sun go down on the decking area – which is also perfect for some alfresco dining. The lodge is a real home from home, and comes fully equipped for a self-catering family holiday. A chemical toilet is required at this campsite. “We loved glamping at this small secluded site near Ross on Wye in the Wye Valley. 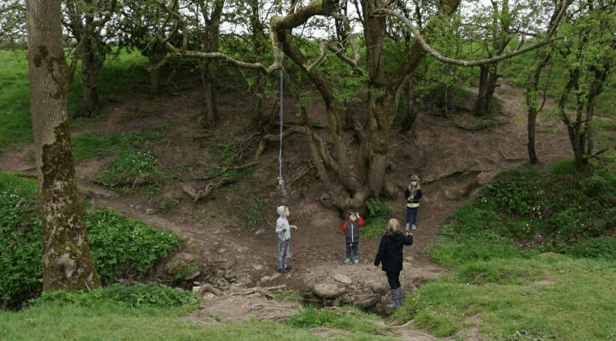 It really encourages free range play for kids and has no wifi or reception so you can really detach from reality for a weekend while wandering down to the river, looking out across the fields or starting a small camp fire to roast marshmallows.” Laura covers more in her review here. The Hayloft, a stunning barn renovation recently completed and located just next door to the glampsite. The Hayloft sleeps 6 and mixes the original wood timbers with contemporary design. Accommodation is by way of 2 double bedrooms and a twin with two bathrooms, an open plan kitchen/dining area, an upstairs sitting room and walled garden. There’s also a woodburning stove, an outdoor covered area with bar and wi-fi. As well as offering extra accommodation, The Hayloft could be a useful ‘backstop’ if your party includes guests who prefer bricks and mortar to glamping out under the stars. This way you can spread yourselves between the glampsite and Hayloft and still come together around the campfire. uUcycled showershack is full of character and boasts hot water on demand, a flushing loo and complimentary organic toiletries for a touch of luxury. In the absence of electricity, lighting is by way of low level solar, fairy lights, lanterns and candles. ‘Van Service’. Enjoy a night off campfire duties and order our home-cooked food hand delivered to you – Thai green curry, chilli con carne, dhal, fruit crumbles. Child friendly dishes available too – just ask! Each caravan also comes with its own firebowl/grill for bbq cooking. All vans are equipped with a coolbox and a communal fridge freezer is located close to the car park where guests can store perishables. Here you will also find firewood, charcoal and firestarter kits for sale. Electric hook ups are available. These will power lights, batteries, fridges, etc, etc. They will not support space heating, water heating and high wattage domestic appliances such as electric kettles. 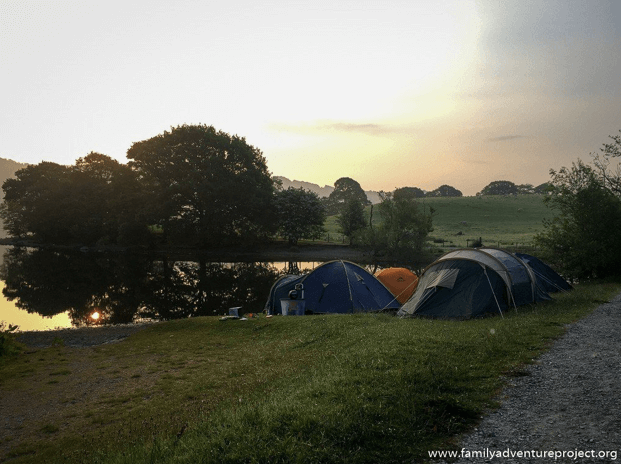 Fisherground Campsite, Eskdale, Cumbria – Lake District. Absolutely perfect; pond with rafts for kids, woodland playground, fires allowed, immaculate facilities, wardens who enforce the no noise after 10:30pm rule, walkable pub, its own miniature steam railway station, stunning panoramic mountain scenery, 15 min drive to England’s deepest lake & highest mountain. Toilet block. It is modern, clean, airy and spacious. Includes hand dryers and hair dryers and coin operated showers. There are also 6 deep sinks for washing-up. Hot water is free, and always available. The Laundry has a washing machine, which is operated by token (available from the Warden), powder is included. There are 3 tumble driers available, which are operated by 50p’s. Camping tents – no electric hook-up points are available for camping. Static caravans – caravans come with central heating, double glazing, fridge freezer, microwave, large flat screen TV with free-sat and dvd player, balcony and picnic bench. Cooking utensils, duvets and bed linen is provided but please bring your own towels and tea-towels. Camping Pods – CastlePods sleep a maximum of two adults and two children. They feature a double bed and a bunk-bed with mattresses but linen, blankets/duvets must be provided by the guest. There is a heater, two twin electric sockets with USB charging ports, lights, picnic bench and decking area. Sorry dogs are not permitted. Standard and Family Pods.These small timber huts feature a wraparound roof, well insulated with sheep’s wool in the walls, and with a special foil layer under the tiles to help keep summer temperatures in check. There’s good head height and plenty of light from the double-glazed lockable french doors which, together with a small high rear window, provide a good through draft. Also provided is an electric socket, heater and lighting. These units do not have beds and you would bring all the necessities of camping minus the tent. Car parking is available for each pod and we have pet friendly options in this range. Toilet, shower and pot wash facilities are a short walk from the CastlePods/Family and Standard Pods. ‘InspirePod’. If you’re looking for a bit more comfort to our standard/family pods this is maybe the choice for you. Tastefully furnished with double patio doors opening onto a large wooden deck area with outside seating to enjoy the great outdoors. – Hook-up only. These are on hardstanding with electric. – Standard. These are fully serviced with a water tap, a drain for grey waste and hook-up. – Superior. As standard but with guaranteed lake view, 16 amp hook-up and a picnic bench. “Campers Kitchen” provides guests an indoor heated amenity in which to prepare meals. Equipped with Seating, washing up basins, twin hobs, microwave, (both 50p tokens) and free use of toasters and kettle. Ice pack freezing and Wifi are available at no charge. Three camping fields, all with electric hook up points, suitable for tents, caravans and motor homes and each have their own modern toilet and shower block. Holiday houses and lodges sleeping 2- 10 people. Electric tent pitches are all on fine camping gravel. Pod – Family pods are suitable for up to two adults and three children. Our 4 Lake view pods now have electricity (2 family and 2 standard size). You’ll need to bring everything you would bring if you were camping in your tent, such as a sleeping bag, sleep mat (if you’d rather put that on top of the mattress), pots and pans, stove and camping chairs. Tree Tents -These canvas tents look like giant tree decorations but are well concealed. You’ll climb a wooden staircase to the entrance and find your little nesting box complete with cosy woodburner and benches which turn into comfy beds.You’ll be safely suspended in the trees and when you’re lying in bed, you’ll be able to gaze up at the little window and enjoy the stars though the canopy of leaves whilst being rocked gently to sleep by the breeze. The tents come with their own rustic camp kitchen set up on the ground below with everything you will need to create delicious camp meals. Up to 3 adults (or 2 adults plus 1 child). Please note that due to the nature of the tents, we cannot accept children under 5 in the tree tents. Safari tents – They are fully furnished and have a wood burner and a gas cooking stove, so you can leave your camping gear at home and look forward to an outdoor stay with a little added comfort. Please note however, that you do need to bring your own bedding and towels.Both tents are suitable for up to 6 people with a double bed and 2 singles and 1 double futon/sofa bed..
Canoes, rowing boats, sit-on kayaks and paddleboards are also available to hire as well as mountain bikes. In high season, wood-fired pizzas are available on certain nights. Pod – eight stunning camping pods and each one can comfortably fit two adults and two children. Bedding not supplied – Camping Pods are like tents but without the hassle of putting them up – you will require everything you would normally bring on a camping holiday. Caravan – one double bedroom and two twin bedrooms and will accommodate up to 6 people. Hardstanding with well drained gravel. Connection to electricity (16amps). Individual water tap, Grey waste. 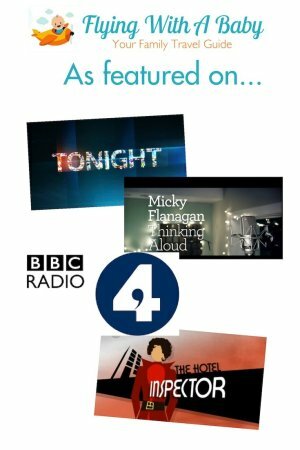 TV connection to BBC1 & 2, ITV, Ch 4, and Freeview (please note that a coaxial lead is required to access the TV connection. These can be purchased from the shop if needed). Grass pitches for small tents. Willow Holt Camping & Caravan Park, Tattershall. “We always used to camp at Willow Holt camping and caravan park in Tattershall, Lincolnshire. It has a decent toilet block, a small play area for the children and a fishing lake. It’s so peaceful there and a great spot to explore from.” Read more of Emma’s thoughts on her stay here. Static caravan – The caravan has the following Double glazing, Central heating, refrigerator, full cooker, microwave, oven, kettle toaster DVD player, colour television, iron & ironing board and vacuum cleaner. Cooking utensils, crockery, pillows, and duvets are provided but not linen e.g. You will have to supply sheets and/or quilt covers and pillow cases, bath towels and t-towels etc. Travel cot, highchair available on request. Ample drawer/wardrobe space. This caravan sleeps six people, one main double bed two single beds and a pull out sofa bed in the lounge. Parking for two cars. Gas and electric free of charge. Fully grass pitches in selected bays with electrical hook up for tents. Modern facilities block which incorporates power showers, washbasins and WC’s and a dishwashing room, all with constant free hot water. Laundry room which is equipped with an iron and ironing board. Water points along with waste disposal areas including chemical waste, with a special disposal area for motor caravans. Fishing is free for park residents, although a current rod license will be required. On site we are able to provide Calor and Camping Gaz, Charcoal, etc all of which may be purchased from the site office. Camping and caravanning accessory shop. “The location is idyllic, and the hosts (Marcus and Lucy), are lovely. They KNOW how important it is for families to feel that their kids are safe roaming, and have lots to entertain them. The facilities are wonderful, and the effort they make to enable independence in the kids, without the worry, is perfect. 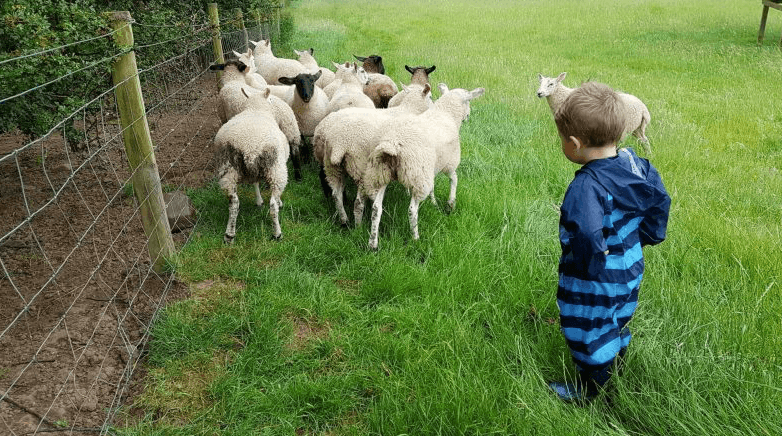 Families with younger children know that they can roam free in the fields, and there is no fear that they are going to get into trouble.” Read Helen’s from Kiddy Charts full review on College Farm here. 4 Pods and 4 Mega Pods. Some hard-standing pitches are available. 100 deluxe pitches with electric hook-up and TV points. 2 amenity blocks with showers, WCs, basins, disabled/family rooms, laundry and washing up facilities. Well-stocked fishing lake (extra charge). Animal paddock with goats, and a sheep. Free Wifi available across the park. Three fully equipped amenity buildings with hot showers, washing facilities, individual cubicles, toilets and razor points. Disabled and baby changing facilities and dishwashing and laundry sinks are also available.During early spring and late autumn, two of the amenity buildings are heated for the extra comfort of guests. A launderette providing washers and dryers is located to the side of the Village Square. Pool, sauna and steam room and gym – Complimentary membership is available to those occupying the lodges. Fun pool – A magnificent place to spend some time and available free of charge to all guests. The enclosed patio is surrounded by an attractive Norfolk stone and flint wall with a backdrop of mature pines sunny and sheltered, where everyone can relax including toddlers who love the integral paddling pool. The outdoor pool is open from late May to the end of August. The site is served by 6 amenity blocks, all with free hot water to the hand basins and good spacious showers! Each field has one block with a large family shower room. Hair dryer and razor points are provided in all blocks. 2 laundry rooms, both with coin operated Miele washing machines and tumble dryers. Freezers are provided for your ice packs on Marl Pit and Moll’s Meadow. There are chemical disposal points and waste facilities on each field. Gas cylinders, tourist information leaflets and advice are available from Reception at the Farmhouse. Static Caravans – Choose from two bedrooms to sleep up to 6 or three bedrooms to sleep a maximum of 8 persons.All caravan holiday home holidays include free gas, electricity, hot water and bed linen, colour TV and DVD. Kitchens are well-equipped and include crockery, pots and pans, a full size cooker, a fridge and a microwave. Bathrooms include a flush toilet, basin and shower. Each pitch is landscaped and comprises a 3 metre by 9 metre fibre-reinforced grass standing area with polyethylene porous grid paving and has electricity, water and grey water waste points as standard. Located on the Touring Park are 2 state of the art amenity blocks, complete with washing up facilities and launderettes. “We loved Sandringham in North Norfolk. It’s hidden among the forest and within easy reach of the coast. There are a few tents you can hire to glamp but we preferred to pitch our tent and claim our little spot. Even going on Bank Holiday weekend the campsite didn’t seem overcrowded and it was great with the kids. 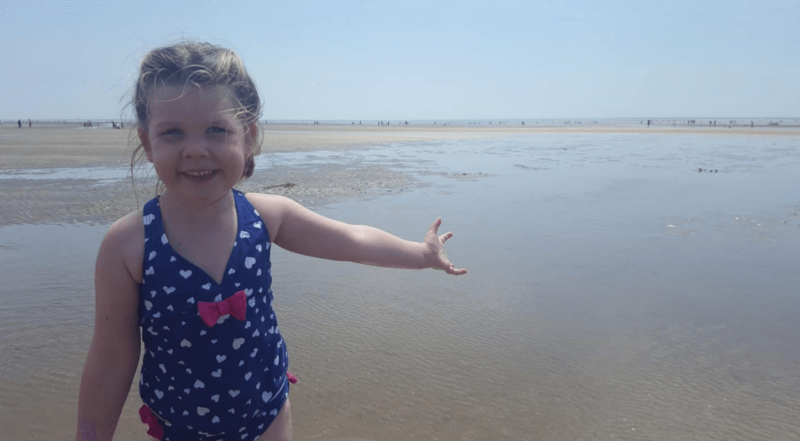 Plus there was so much to see around the coast within a few minutes.” To read more of Cery’s from Rainy Day Mum review – see here. 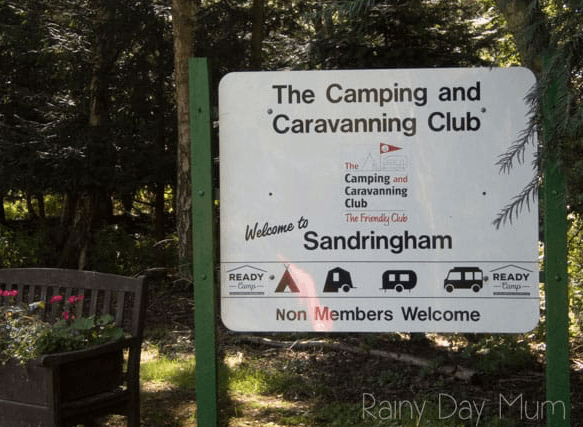 Bookings for the sites cannot be made through the Sandringham site: For bookings, please telephone 01553 631614 (Caravan & Motorhome Club site) or 01485 542555 (Camping & Caravanning Club), or use the links below. “We really enjoyed Swiss Farm in Henley on Thames. It has a great open air pool, loads of space for the kids to play and really nice facilities, but the best part was watching the red kites circling overhead.” – Kelly from It’s a Tink Thing. Standard tent pitch – 12m x12m pitch. 15m x15m pitch with 10amp electric hook up. 15m x 15m pitch with 10-amp electric hook up, a tethered picnic bench and conveniently located water point. Static Caravan hire – four or six berth occupancy which cannot be exceeded. Three En-Suite Super Pitches in Field 5, which are suitable for caravans, motorhomes or tents.These pitches each have their own ‘pod’ consisting of a private toilet, shower and storage shed. En-Suite Pitches have a tarmac area (for the caravan, motorhome and/or car) and rubber matting area (for the tent or awning).They are fully-serviced Super Pitches with a fresh water tap, waste water drain connection, car parking space, storm drain and of course electric hook-up. Each pitch also has its own mini-fridge and picnic bench. Grass, Hardstanding and En-Suite Super Pitch. All pitches are spacious and level with plenty of room to park the car alongside your unit. 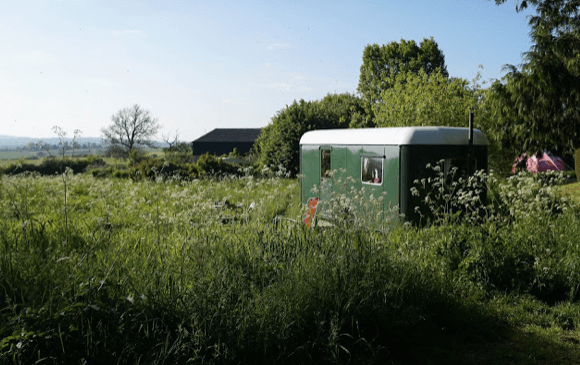 Shepherds hut – suitable for 2 people and 1 well behaved dog. Lakeside Log Cabins – Both the cabins are light and spacious, tastefully furnished, fully equipped to a high standard. Use of electric and gas is inclusive as wall as bed linen for all beds and sofa beds. Towels are not provided so guest will need to bring their own as well as washing up liquid, bin bags etc. one sleeps 4+2, the other 6+2. B&B Shepherd’s Huts – All bedding is provided for you and the bed is made up for your arrival. There is a kettle and a small fridge for essentials such as milk. You also have a log burner for your use for those chilly evenings, we will supply you with some fire wood free of charge and additional wood can be purchased from reception. There are no toilets or showers at the Shepherd’s Huts but these facilities are just a short walk away. Towels are not provided. Safari Tents – All bedding is provided for you and all the beds are made up for your arrival. There is kettle, toaster, standard size fridge with freezer compartment, pots & pans, kitchen utensils, crockery and cutlery supplied. There is a BBQ and gas strove usable for cooking outside the tent. There are plenty of standard household 13 amp sockets available for use throughout the tent. There is also a large log burner for your use for those chilly evenings, we will supply you with some fire wood free of charge and additional wood can be purchased from reception. There are no toilets or showers at the Safari Tents but these facilities are just a short walk away. Towels are not provided. Camping Pods- You need to bring all your own camping equipment with you as nothing is provided. The pods are essentially like a wooden tent with a carpeted floor, heater and lamp. Most guests tend to bring blow up mattresses or camping beds plus bedding. There are two standard household 13 amp sockets inside the pods. `Hardstanding gravel and grass pitches so all unit types can be accommodated. Many pitches have electric hook-up. Some have water hook up. Low flush pump action toilets in the fields, by the barn area we have flushable toilets, hot water facilities including showers and washing up. Brand new shower block with hot showers, washbasins and toilets including a dedicated disabled/family room in both male and female washrooms. A separate facility provides sinks for pot washing and 2 large communal fridge freezers. There is a small shop selling a few basic essentials and our ever-popular fire pits are available to hire on request. Grass – You can pitch your tent, caravan or motorhome on the traditional grass pitches or try the new artificial grass pitches. All weather – all-weather pitches are hardstanding which is wide enough for your caravan and awning with grass to the side. A gravel road leads directly to your pitch. 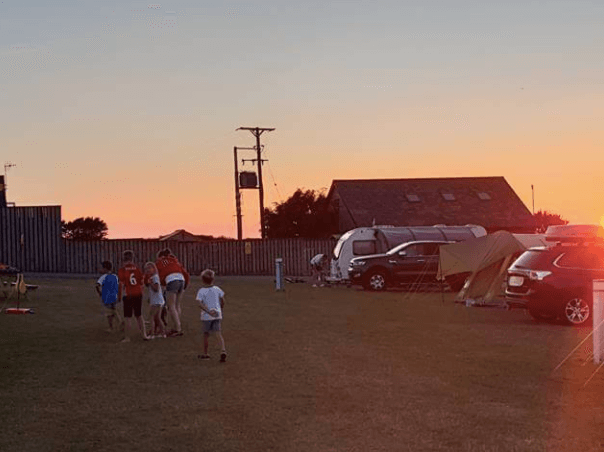 Luxury – extra-large hardstanding pitches with ‘all-service’ connections for water, drainage, 16 amp electric and TV aerials. Shower blocks include privacy wash cubicles, free power showers with underfloor heating, hair and hand driers, and shaver points. A designated toilet/shower room for disabled guests and a family bathroom for parents with young families. Baby change facilities are also provided. 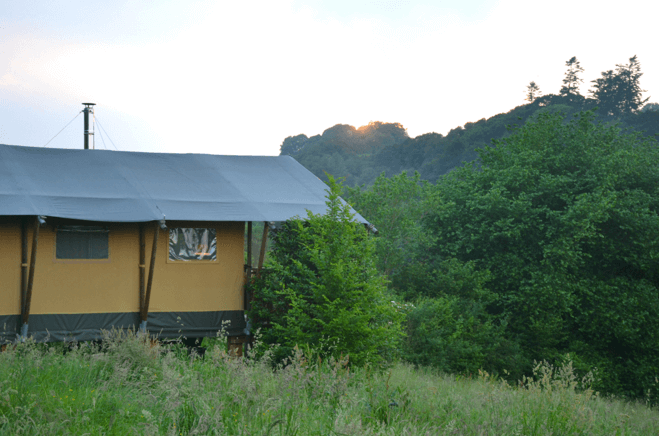 Glamping pods – sleeps 4-6 Glamping pods have a heater, plug sockets, picnic bench and fire pit. Hardstanding Pitches with Electric hookup, Water and Drainage. Motorhomes, Caravans, trailer tents and Campervans are welcome on our Large Hardstanding Pitches. Tents, Trailer Tents and small Campervans (under 4 meters) are welcome on our Large Grass Pitches with or without Electric Hook Up. Indoor heated pot-wash room including communal fridge and freezer, (do bare in mind that these do become rather full during busy periods and during any warm weather. Mobile Bakery! Freshly baked bread and bread buns available from 1145am until 1230pm at the village green every Saturday! Delicious home baked food and fantastic whole ground coffee all served from Liza Jane- a beautiful vintage caravan. “The perfect site for camping with a toddler. 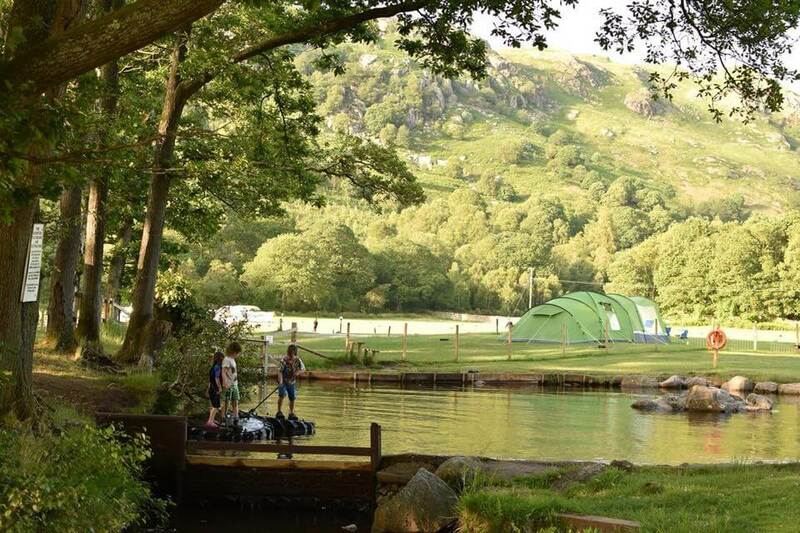 Very clean, plenty to do and lots of places to explore.” Read more about Catherine’s visit and why she thinks Woodhouse is on of the best campsites in England for families here. touring campers – Each pitch is spacious with an electric hook up and enough room for a full size awning and parking for one car. Clachtoll Beach Campsite, Sutherland, Scotland remote & rural with an amazing beach. There is no longer a chemical disposal point. You can still dispose of your waste providing you use Environmentally friendly chemical’s only! toilet and shower facilities, dishwashing sinks, laundry, Eco friendly toilet disposal point, electric hook-ups, hot drinks / soup vending machine, free Wi-Fi, hairdryers, hair straightners, media charging lockers & a freezer for ice packs. Fidden Farm, Isle of Mull – Scotland close to the beach. 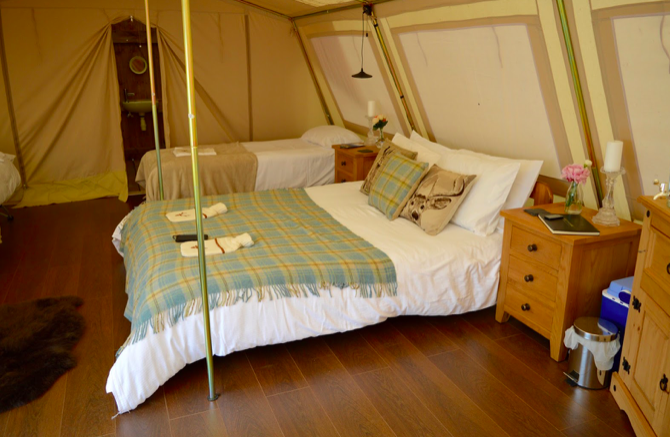 “Our favourite ever glamping site is Dundas Castle near Edinburgh. The tents are very luxurious and well spaced out so you can’t see anyone else. The views and walks in the surrounding areas are gorgeous. Definitely a place to visit if you’re looking to be surrounded by nature and peace and quiet” To read more of Sam’s full review see here. Caravan pitch with electric hookup (16 Amp), water supply and drainage. Awning included in pitch price. All 66 of the fully serviced caravan pitches are available to book. Restaurant & bar offering breakfast (May-Sept), lunch and dinner. 24 hour park supervision from May – October. no noise policy after 11pm. Shop selling a range of groceries, equipment, gifts and souvenirs. “Loch Ness Shores is one of our favourites. 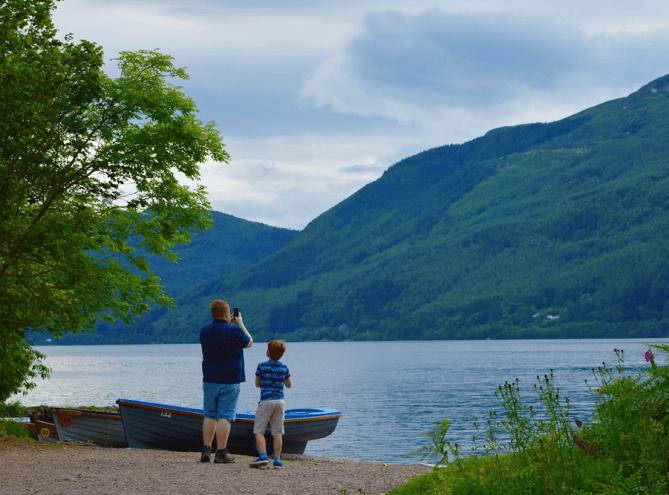 It’s right on the banks of Loch Ness and you can hire boats/make campfires on the shore. There’s a play park for kids, a bar/cafe and a little retro food truck serving up delicious food. Loos are immaculate too.” For more of Sam’s review, and why she feels this is one of the best campsites for kids in Scotland read here. wigwam cabin – They accommodate 4 – 5 people and come equipped with a Microwave, Kettle, along with a TV socket. Under floor heating in Am Fasgadh; the Reception/Shop and amenity block, from home shower rooms. Wigmam – Large Standard Wigwam with sea view. Wigwam can sleep up to 5 people comfortably on raised bed platforms with mattresses provided. Inside: Kitchen sink, Heater, Microwave/grill, kettle, fridge, toaster and plug power points provided. Extra En-Suite style room with WC and basin. Outside: Picnic bench, parking for one vehicle and a campfire area. Sustainable Wood for your campfire to be purchased from site. Wigwams have a Meter for electricity – cards £1 from reception. Wigwams occupiers also have access to Site Cook-House where there are additional cooking facilities. Please bring your own bedding/towels. Pets welcome – If bringing a pet, please bring their bed/basket. Grass and/or a hard-standing pitch. Some pitches have an added bonus of a sea view. Every pitch is spacious, has a picnic bench and fire-pit. Some pitches with electric hook-up (EHU) and you park at your pitch. Caravan/Motorhome – spacious grass and hard standing pitch with 16 Amp EHU point. Picnic table and fire-pit on every pitch. Caravan pitches have access to heated WC/Shower block, children’s play area and farm/nature trail. Nearby, short woodland walk to little bay. All hard standing caravan pitches have a sea view and no charge is made for an awning. 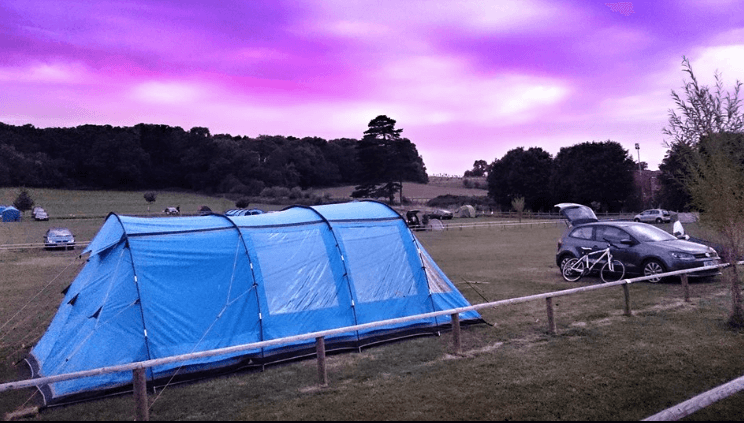 Non EHU tent – Spacious grass pitch. In the camping field or summer field, picnic table and camp fire-pit at every pitch. Camping field has access to heated WC/Shower block, children’s play area, washing-up area and farm/nature trail. Nearby, short woodland walk to little bay. Summer field camping area enjoys sea views. Spacious grass pitch and 16 Amp EHU point. Picnic table and Camp fire-pit at every pitch. Camping field has access to heated WC/Shower block, children’s play area, washing-up area and farm/nature trail. Nearby, short woodland walk to little bay. 50 fully serviced hardstanding pitches. (no grass) Each pitch has 16 amp electric, its own water tap, grey water discharge and lawn area. Thirteen of these pitches have their very own private hot tubs. 40 electric hook-up pitches and approximately 40 standard pitches without electric hook-up. Large self enclosed timber adventure play area with balance beams, climbing wall, bridges, a tunnel, two den areas and a slide. Farm walk featuring rare miniature animal breeds, including cows, goats, pigs, donkeys, sheep, ponies ducks and hens. Hot water is free and is available 24 hours a day in our toilet and shower blocks, our laundrette and our dish washing facilities. showers cost 20p for about four minutes. caban – Beds: Kingsize bed, 2 single beds, cupboard bed (sleeping 2 children or 1 adult), ready made for your arrival. – Washing up liquid, cloths & teatowels. Riverside – Picturesque pitches available with or without electric hookup. Open your tent or caravan door to the beautiful sight and sound of the river Seiont. Playground View – Popular with families. Watch your children enjoy themselves on our playground in the middle of the campsite, while you relax with a coffee or glass of wine! Available with or without electric hookup. Deluxe – Perfect for motorhomes, and caravans, these hardstanding pitches are in a secluded area of the site with their own electric, water & TV points. Each pitch is attractively landscaped with a lawn area for relaxing on sunny days. Back to Basics – Camping like it used to be, a simple grass pitch on the main field. 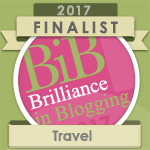 Please let me know if you have any recommended best family campsites (UK) to add to this page! Don’t forget to tell why you enjoyed your stay so much!